The U.S. Equal Employment Opportunity Commission (EEOC) recently announced that it has filed a national origin harassment lawsuit against Fidelity Home Energy, Inc. (Fidelity) pursuant to Title VII of the Civil Rights Act of 1964 (Title VII). National origin harassment is a form of national origin discrimination prohibited by Title VII. On March 7, 2019, the EEOC filed the lawsuit, EEOC v. Fidelity Home Energy, Inc., Case No. 19-cv-01231, in the U.S. District Court for the Northern District of California after initially attempting to reach a pre-litigation settlement through its statutorily mandated conciliation process. In this article, our Marion County, Florida employment discrimination lawyers explain the EEOC’s allegations against Fidelity. Fidelity, which is based in San Leandro, California, sells solar panels and other energy-efficient products. Ayesha Faiz (Faiz), a woman of Afghan descent, was employed by Fidelity as a representative services supervisor. In this position, Faiz was responsible for making appointments with Fidelity salespersons with potential customers. 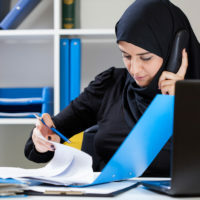 The EEOC alleges that within her first week of employment, Faiz learned that Fidelity maintains a practice of rejecting customers perceived to be of Middle Eastern or Indian descent. Faiz observed supervisors placing individuals who appeared to be of Middle Eastern or Indian descent on an internal “Do Not Call” list and flagging their records in the company’s internal data base with comments such as “Not Qualified” or “Indian Name” to disqualify them from getting appointments with Fidelity salespersons. Based in Ocala, Florida and representing employees throughout Central Florida, we have represented employment discrimination victims in hundreds of cases before the EEOC. If you have been a victim of national origin discrimination or have questions about filing a complaint of discrimination with the EEOC, please contact our office for a free consultation with our Marion County, Florida employment discrimination attorneys. Our employment and labor law attorneys take employment discrimination cases on a contingency fee basis. This means that there are no attorney’s fees incurred unless there is a recovery and our attorney’s fees come solely from the monetary award that you recover.